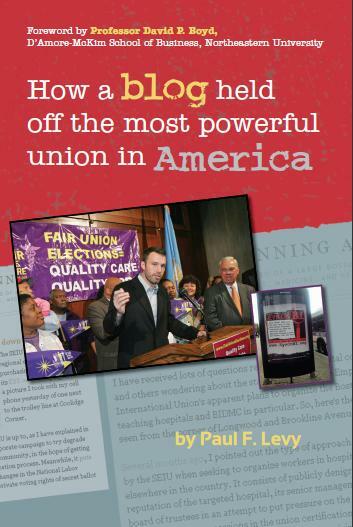 This blog accompanies the book How a Blog Held Off the Most Powerful Union in America, by Paul F. Levy. It is a compendium of the all of the posts from the Running A Hospital blog that were issued by Mr. Levy during the SEIU’s corporate campaign against Beth Israel Deaconess Medical Center. The decline in private sector unions in America is well documented, but some unions have bucked this trend, most notably the 2.1 million member Service Employees International Union. Its former president liked to say: “We use the power of persuasion first. If it doesn’t work, we try the persuasion of power.” The targets of SEIU’s corporate campaigns find themselves on the defensive and, tied to traditional public responses, are often flummoxed by the intensity and thoroughness of the SEIU’s efforts. There is, however, a new arrow in the quiver that can be used by firms that are being attacked in a corporate campaign. Social media offers an effective remedy, if used early, thoughtfully, and decisively. This book tells the story of one such counter-campaign, a story of how a blog held off the most powerful union in America. The blog posts are printed here in chronological order, showing the original publication date. The book is available at Amazon and through other regular distribution channels. E-books are available on all platforms. Mr. Levy is available for speaking engagements to interested audiences. Please contact him at exposingtheplaybook [at] gmail [dot] com.